Josefus came back together to create a simple website and go through dozens of old audio tapes. Tracks were chosen for what would become the Dead Man aLive CD. The photo above shows Dave, Pete, and Ray on stage with Leesa for the first time in about ten years. We dropped by a club on Washington where she was playing that night. 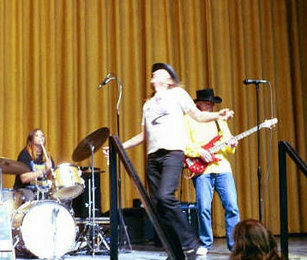 The Dead Man aLive CD was released in the spring of 2002 at the Austin Record Convention. We were at the show Saturday and Sunday to sign copies, and we brought guitars in case we found a jam somewhere Saturday night. But it turned out that live music was part of that year's show. We were invited to do a few songs before the scheduled acts on Sunday. 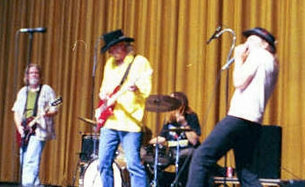 We played on the same big stage where we had played our first major concert, opening for Grand Funk Railroad in 1969.